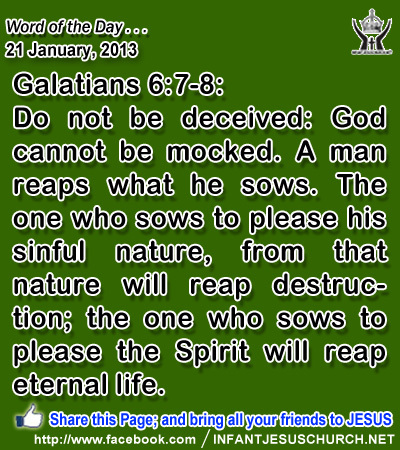 Galatians 6:7-8: Do not be deceived: God cannot be mocked. A man reaps what he sows. The one who sows to please his sinful nature, from that nature will reap destruction; the one who sows to please the Spirit will reap eternal life. Heavenly Father, who lived before time began and who will be the Great I AM when time is no more, bless the seeds we spread that they may bear fruit to you and bless those we love. Through Infant Jesus, the grain of wheat who died and was buried so that true life may flower forth. Amen. 18Now John's disciples and the Pharisees were fasting; and people came and said to him, "Why do John's disciples and the disciples of the Pharisees fast, but your disciples do not fast?" 19And Jesus said to them, "Can the wedding guests fast while the bridegroom is with them? As long as they have the bridegroom with them, they cannot fast. 20The days will come, when the bridegroom is taken away from them, and then they will fast in that day. 21No one sews a piece of unshrunk cloth on an old garment; if he does, the patch tears away from it, the new from the old, and a worse tear is made. 22And no one puts new wine into old wineskins; if he does, the wine will burst the skins, and the wine is lost, and so are the skins; but new wine is for fresh skins." . Jesus goes on to warn his disciples about the trouble of the "closed mind" that refuses to learn new things. Jesus used an image well-known to his audience – new and old wineskins. In Jesus' times, wine was kept in wineskins, not bottles. New wine poured into skins was still fermenting. The gases exerted gave pressure. New wine skins were stretchy enough to take the pressure, but old wine skins easily burst since they were hard. What did Jesus mean by this assessment? Are we to reject the old in place of the new? Just as there is a right place and a right time for fasting and for feasting, so there is a right place for the old as well as the new. Jesus says the kingdom of heaven is like a householder who brings out of his wealth what is new and what is old. How poor we would be if we only had the Old Testament or the New Testament, fairly than both. The Lord gives us wisdom so we can make the most excellent use of both the old and the new. He doesn't want us to hold strictly to the past and to be resistant to the new vocation of his Holy Spirit in our lives. He wants our minds and hearts to be similar to new wine skins – open and ready to receive the new wine of the Holy Spirit. Are we eager to grow in the knowledge and thoughtful of God's word and plan for your life? Loving Infant Jesus, fill us with your Holy Spirit, that we may grow in the knowledge of your great love and truth. Help us to seek you earnestly in prayer and fasting that we may turn away from sin and willfulness and confirm our life more fully to your will. May we always find joy in knowing, loving, and serving you.